Frank W. Nodoline, 70, of Forks Township, passed away Saturday, August 25, 2007 in Easton Hospital. October 23, 1936 in West Easton, he was a son of the late John and Mary Smith Nodoline. Born: He and his loving wife, the former Carol Ann Bechtel, celebrated their 49th wedding anniversary June 14, 2007. 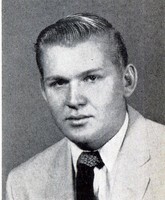 Personal: He was a 1956 graduate of Easton High School, where he was captain of the football team his senior year. He attended the University of Miami where he also was on the football team. He graduated from Temple University. Frank was a special education teacher for 32 years, retiring in 1993 from Colonial Intermediate Unit 20. He served on the Easton School Board for four years. Frank loved to hunt at the family cabin with his brothers. He and his wife spent the summers camping at Lake Wallenpaupack and he loved to travel. Membership: He was a member of St. Jane Frances de Chantal Catholic Church. He was also a member of Liberty Hose Co., Citizen Hose Co., Safety First Volunteer Fire Co. and the Northampton County Chapter Pennsylvania Association of School Retirees. Survivors: In addition to his wife, Carol; three daughters; Cathy Briggs and her husband Robert of Alabaster, Alabama, Karen Nodoline of Forks Township and her fiance Matt DiVetro, and Lisa Clause and her husband Donald of Hamburg; four brothers, James of Palmer Township, Henry, Thomas and John Jr., all of West Easton; two sisters, Delores Herkalo of Bayfoot, Florida and Carol Matlock of Pocono Lake; three grandchildren, Kaitlyn and Marissa Briggs, and Joshua Clause; two uncles, cousins, nieces and nephews. Two brothers, Alfred and Joseph died earlier. Services: 9:30 a.m. Wednesday from the Strunk Funeral Home, Inc., 2101 Northampton Street, Wilson Borough, followed by a Mass of Christian Burial at 10 a.m. in St. Jane’s Catholic Church, 4049 Hartley Avenue, Palmer Township. Call Tuesday 6 to 8 p.m. in the funeral home. Burial will be in St. Joseph’s New Cemetery.